According to the English Dictionary, a “hipster” is someone who “follows the latest trends and fashions, especially those regarded as outside the cultural mainstream.” The class of people has existed for many years, with its own specific sense of fashion, music, film, and so on. Here are some of the most hipster gadgets ever to be released. The Lytro Light Field Camera, originally released in 2012, pretty much typifies what it means to be a hipster gadget. The funky design, high price tag, and quirky use case—essentially, it allowed the photo to be 're-focused' after it was taken—all point to the hipster ideal. Unfortunately, the Lytro didn't take off commercially and the company now makes high-end video recording software that can be refocused after the movie has been shot. For a time, though, Lytro made one of the most typically hipster gadgets. Supreme, the well-known New York-based skate brand, has released some classic accessories in the past—but none more so than the collaboration with Mophie, the maker of portable chargers for various smartphones. The Supreme x Mophie charger is no longer available to buy new, but retails for around $200 (£140), on eBay. Aside from the red-and-white Supreme branding, the charger was much the same as Mophie's other models—which, by the way, retail for around £35 ($50), but could only charge an iPhone, thanks to its Lightening connector. Supreme is famously secretive about its work, especially how many items they make and sell, so it's impossible to tell if the project was a success, but it certainly ranks as a hipster gadget. iPhone speakers come in all shapes and sizes, including a gramophone. You would've thought that the gramophone, typified by its giant speaker, would have been quietly sidelined as newer, better speaker designs arrived, but no. According to a list on Etsy, the independent shopping website, a gramophone-shaped speaker dock for the iPhone retails for over £350 ($500), a steal for anyone who wants to mix 2016 with the 1950s. It's unclear whether the speaker quality is better than, say, a Bose Soundlink—which costs around £70 less—but it could be the case. The iPad's on-screen keyboard is widely accepted as being tough to type on, especially for longer messages, but there are various third-party—or, more recently, Apple-made—options available. However, there is also the option of having a £500 ($720) typewrite-styled keyboard which, when paired with the iPad, has to be used on a table. 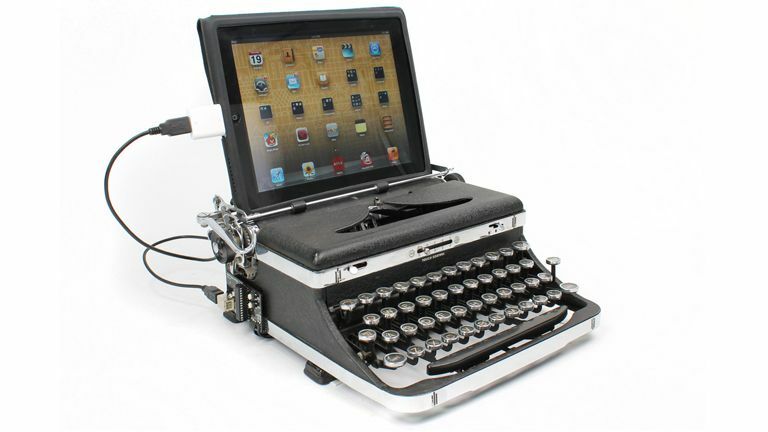 The device has its own battery, casing, and resembles a typewriter from yesteryear with borderline insane detailing. Anyone who complained that Apple's Smart Keyboard case, launched alongside the iPad Pro, was expensive better not look at this case. Hoverboards were all the rage over Christmas, with various regulatory authorities—as well as many on- and offline merchants—banning them. That hasn't stopped some serious investment in making them, which has ultimately culminated in the Hoverbord 360, which comes in gold and costs £450 ($650). The 'board, which has no handlebars and requires the rider to stand upright, can go 12 mph for over 10 miles. Suffice to say, there is nothing more countercultural than that which has been banned by the U.K. and U.S. government. Do you want your iPhone to be much bigger, heavier, and harder to fit in your pocket? If the answer to these questions is yes, then this 80's retro iPhone case is for you. While it's not very expensive —just £5 ($10)—it does represent an odd trend in modern culture whereby people actively want their gadgets to resemble those which have been obsoleted, usually by something better. Apple will likely be a little upset after putting so much time and effort into making each iPhone thinner and lighter, but the option is available to anyone that wants it. A recent entry to hipster-ville, the Daguerreotype Achromat 2.9/64 Art Lens is a modern day recreation of a camera lens dating from 1839. Yep, you read that right - they've gone and remade a lens that is 177 years old. That 19th century lens created dreamy, soft focus images due to a totally unintended series of aberrations in its image-forming optical system. This modern lens, in true hipster style, has been specifically designed to keep those aberrations intact. T3 recently covered the lens in more depth, however simply put, it is a rather expensive toy for hipster photographers and film makers to experiment with. And finally a bit of fun. A papier-mâché deer, made out of newsprint, may not be on your Christmas list, but it was on someone's. Sold by WestElm, a firm that specialises in strange gifts, the deer's head—replete with antlers—sells for between $59 and $99, according to a buying guide. The largest model measures about 20-inches (50.8 cm) in height, making it unmissable in any sitting or dining room. Each model is handmade and imported from Haiti, according to the website. Too bad that you are too late to get your hands on one.